In the last 20 years, the rate of obesity in children has increased. Obesity now affects about one in six children and adolescence. Obesity increases the risk of diabetes, stroke, some cancers and cardiovascular disease. Also, the medical costs associated with obesity are quite excessive. Childhood obesity is preventable, but for a number of reasons, it is getting worse rather than better. This is a serious issue that we need to deal with rather than just ignore. We all have pictures of us as kids with chubby cheeks, but obesity is but obesity is more than just baby fat. Obesity is a dangerous illness with far-reaching consequences for a child’s physical and mental health. And these consequences cannot be outgrown. Promoting a healthy lifestyle is best accomplished by dealing with it as a family with teamwork in mind. 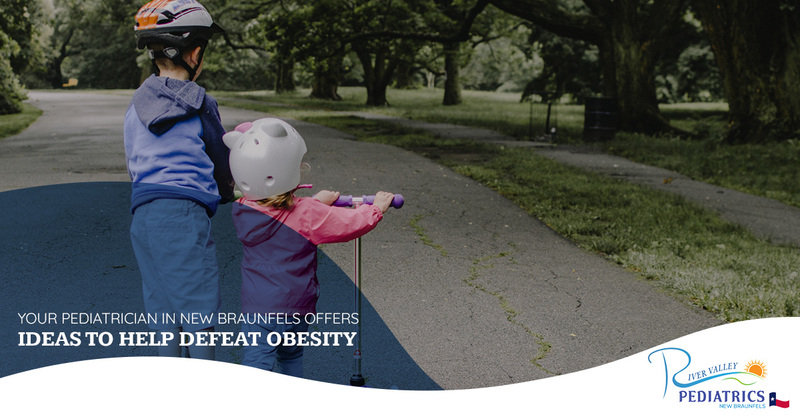 River Valley Pediatrics and your pediatrician in New Braunfels takes a look at what you can do to help stop childhood obesity. As a parent, the first thing you can do to battle obesity is to be a positive role model for your kids. It is that much more difficult to get your kids to eat a balanced and healthy diet when they see their parents eating junk food. From the moment your children begin to eat solid foods, you need to feed them balanced diets. Babies love food with different textures and different colors, this is a great way to introduce them to fruits and vegetables. It is also important to avoid sugary foods and saturated fats. Children love to play and explore, but modern lifestyles involve doing much of that exploring watching television while sitting on the couch. Sure, your children can learn a lot from watching educational programs, but it is healthier if they go outside and play and explore. Instead of learning about nature from a television show or video, take your children on a nature hike and to the zoo, it gives them fresh air, exercise and it’s so much fun. Kids look forward to a little after-school snack. But if you aren’t prepared, you wind up giving them whatever you happen to have in the refrigerator or cupboards. Include healthy snack on your grocery list and detail what days you will dole out which snacks. This way, your children will have a healthy snack waiting for them when they get home from school. Plan family activities that involve plenty of movement. You can go for walks together, bike rides together and play active games in the park or in your own backyard. Park far away from the grocery store entrance to make your family walk more. At the mall, take the stairs instead of the escalator. There are many ways in which you can get yourself and your kids to put forth that extra effort, all you need to do is change things up a bit. From the birth of your child, they should be receiving regular well-child exams to ensure they are healthy. During these exams, your pediatrician will check BMI (body mass index) and look for other early sign of obesity. This way, there is plenty of time to reverse the changes before damage can occur. You might be wondering the reason your child needs to have a physical. There are a lot of things that can change in a child’s or teen’s health over the course of a year. When you schedule a physical, you are essentially monitoring your child’s growth, development and health. When you take your child to their physical, you are safeguarding against any problems that might arise. Give River Valley Pediatrics a call today.